Click the button below to add the Sonata in a minor K.175 by Scarlatti/Meyer to your wish list. Since his professional concert debut at the Teatro de la Opera de Maracay, Mr. Meyer continues to appear in recital, as a chamber musician, and soloist with orchestra in venues throughout North America, South America, and Europe. Highlights include concerts in Carnegie Hall’s Weill Recital Hall and Zankel Hall (New York City), Wolf Trap (Virginia), the Skirbal Cultural Center (Los Angeles), the historic Basilica di San Clemente (Italy), the Museo de Barquisimeto, Museo del Teclado, the Sala José Felix Ribas, the Teatro de Teresa Carreño (Venezuela), Liviu Rebreanu, Gheorghe Dima Music Academy, the National College of Art Ion Vidu (Romania), the Fészek Muvészklub (Hungary), and the Ford Center for the Performing Arts (Canada). In addition to live concerts, his performances have been featured on film, radio and most recently, on the Albany records label. Mr. Meyer holds degrees in music composition and performance from the State University of New York at Fredonia and master of music and doctor of musical arts degrees from the Eastman School of Music. 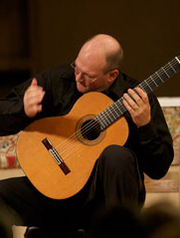 He has served on the faculties of East Carolina University, SUNY at Fredonia, and the Eastman School of Music and currently directs a thriving guitar studies program at the Syracuse University Setnor School of Music. Dr. Meyer resides in Geneva, N.Y. with his wife and two young sons. Ken thank you for this arrangement! I spent the semester working through this with a student and you have created a brilliant edition!!!!! I may have to learn this now, thanks... not enough to do. Just stumbled across this arrangement of the classic K.175 sonata and finally a edition that rivals Williams arrangement and a plus not only is it for sale but only $8.